Walls cannot talk. However, they can be moved. If you've taken a peek inside K-Dog recently, you may have noticed that there is a new wall sealing off what was the door to the office. To give them more elbow room, the office is set to become part of the food preparation area. The office will be relocated downstairs. We did not get the skinny on why the Dog is making these changes. We're guessing it has something to do with improving service - based on what we could see, it looks like the new prep area could accommodate two in the event that things get busy. ...but with pictures! Motion pictures, that is. If you are a filmmaker or just like watching independent films, stop in at K-Dog tonight from 7 - 9pm. You'll be treated to the work of a handful of local filmmakers. 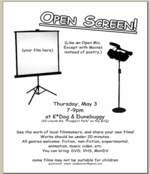 You can also bring your own film to share with others. For more information email zludescher@gmail.com. K-Dog & Dunebuggy (43 Lincoln Rd.) celebrates one year of serving PLG today. Stop in, buy a cupcake and wish them a happy birthday! On this anniversary of K-Dog, we have to say that we continue to be impressed with how friendly the owners and employees are. The food and beverages are a great addition to the culinary options in the neighborhood, but it's K-Dog's warm vibe that lends strength to the neighborhood's sense of community. 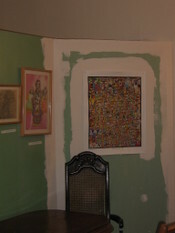 The artwork of Randy Harmon, PLG resident, is currently on display at K-Dog & Dunebuggy (43 Lincoln Rd). Though it was under construction the last time we checked, Harmon's work (presumably) can be seen on his website: www.rpharmon.com. Take some time to check out his work at K-Dog. His work, as they say in the world of fine art, strikes us as really cool. When you swing into K-Dog (43 Lincoln Rd. ), make sure to take some time to stop and smell the artwork. Barthelemy Atsin's paintings and apparrel are on display and they're mighty impressive. Check out additional images of his work at www.batsin.com. UPDATE: Mr. Atsin will be appearing at K-Dog tomorrow, February 3. He'll be creating portraits for $2 and conducting some activities for kids. We just learned that Zenobia McNally, candidate for Yvette Clarke's now vacant City Council seat, will appear at K-Dog & Dunebuggy on January 11, 7pm - 9pm. As we've said before, we have not met any of the other candidates vying for the seat, but we get the sense that Zenobia is well acquainted with PLG and in touch with the needs and wants of residents. Click on the flyer to see a larger version, complete with contact information. Check her out. K-Dog & Dunebuggy will soon be adding made-to-order salads to their menu. We looked over the new offerings, but we're sad to say that our memory isn't what it used to be and we can't recall exactly what the offerings are. We remember seeing Nicoise, but you'll have to stop in to find out about the rest. 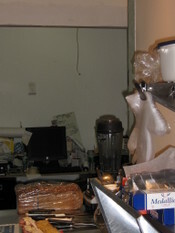 We were also told that the addition of a sandwich press is under investigation. This means that you'll probably soon have access to panini-style sandwiches right here in PLG. Should you happen to stop into K-Dog sometime soon (we're sure you will; you'll also purchase copious amounts of coffee) you'll see the work of Karl A. McIntosh on display. His work has been exhibited all over the place, from Brooklyn (the Museum, that is) to South Carolina. "Some call McIntosh a folk artist, others call him primitive, some say he's an outside the mainstream artist, but whatever the title, most would probably agree that an apt description of McIntosh would simply be genius. Check the pieces out - the variety is impressive, as is the craftsmanship. After a few months in waiting K-Dog & Dunebuggy finally got its facelift. The new awning and sign came in last week, and we think that the new storefront is a great addition to the aesthetic of Lincoln Rd. We're hoping that K-Dog influences its neighbors, some of whom have some pretty shabby appearances. But not to worry, it's still the same great cafe beneath the new mug. PLG's own Marcia Lloyd hung her photographs at K-Dog & Dunebuggy on Lincoln Rd. yesterday. The exhibition, entitled, "Portraits: Italy/New York," officially opens on Sunday, September 10 from 5 - 6:30pm. 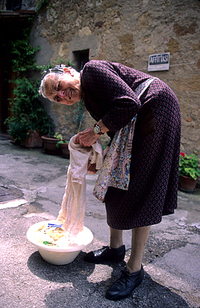 As described by Lloyd herself, the exhibition "reflect(s) my fascination with the difference in the faces of people in Italy and New York, particularly those of older people, and the reflection of the differences in attitudes toward aging in both places." 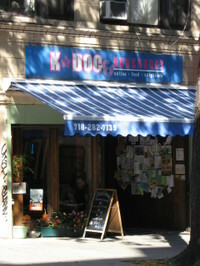 So, swing in to K-Dog and check it out. Have a coffee while you're there.